As a young boy, award-winning Indonesian filmmaker Joko Anwar loved to watch movies. He often visited a dilapidated cinema called Remaja Theatre in his hometown of Medan, Indonesia. The cinema was well known for screening horror and martial arts films. “Sometimes, I purchased a ticket, and other times, I just peeked through the vents,” says Joko, 41, in an interview with theSun. One film that left a lasting impression on Joko was director Sisworo Gautama Putra’s Pengabdi Setan, an iconic Indonesian horror film released in 1980.The film tells the tale of a recently widowed man and his two teenaged children who notice eerie incidents happening in their home. Pengabdi Setan terrified audiences in Indonesia when it first came out, and was even shown in the United States and Japan. It remains a cult hit internationally even today. Now, 27 years later, Joko is remaking this iconic horror film. His version of Pengabdi Setan was shot over the course of 18 days in April, and will play in Indonesian cinemas at the end of the year. The remake is the culmination of a dream for Joko, as the original film remains one of the strongest memories he has of going to the cinema. “The [original] film still gives me the chills,” he says. 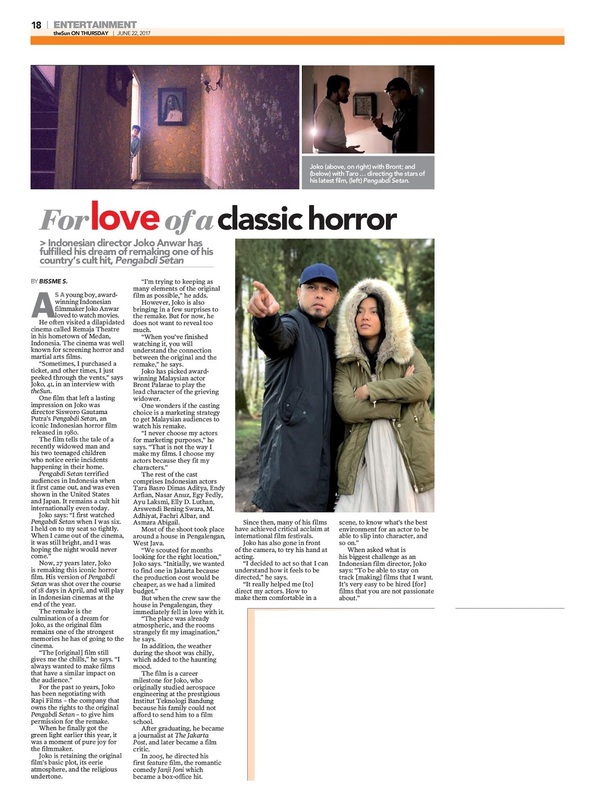 For the past 10 years, Joko has been negotiating with Rapi Films – the company that owns the rights to the original Pengabdi Setan – to give him permission for the remake. When he finally got the green light earlier this year, it was a moment of pure joy for the filmmaker. Joko is retaining the original film’s basic plot, its eerie atmosphere, and the religious undertone. “I’m trying to keeping as many elements of the original film as possible,” he adds. However, Joko is also bringing in a few surprises to the remake. But for now, he does not want to reveal too much. “When you’ve finished watching it, you will understand the connection between the original and the remake,” he says. Joko has picked award-winning Malaysian actor Bront Palarae to play the lead character of the grieving widower. One wonders if the casting choice is a marketing strategy to get Malaysian audiences to watch his remake. “I never choose my actors for marketing purposes,” he says. The rest of the cast comprises Indonesian actors Tara Basro Dimas Aditya, Endy Arfian, Nasar Anuz, Egy Fedly, Ayu Laksmi, Elly D. Luthan, Arswendi Bening Swara, M. Adhiyat, Fachri Albar, and Asmara Abigail. Most of the shoot took place around a house in Pengalengan, West Java. “We scouted for months looking for the right location,” Joko says. But when the crew saw the house in Pengalengan, they immediately fell in love with it. “The place was already atmospheric, and the roomsstrangely fit my imagination,” he says. In addition, the weather during the shoot was chilly, which added to the haunting mood.The film is a career milestone for Joko, who originally studied aerospace engineering at the prestigious Institut Teknologi Bandung because his family could not afford to send him to a film school. After graduating, he became a journalist at The Jakarta Post, and later became a film critic. In 2005, he directed his first feature film, the romantic comedy Janji Joni which became a box-office hit. Since then, many of his films have achieved critical acclaim at international film festivals. Joko has also gone in front of the camera, to try his hand at acting. “I decided to act so that I can understand how it feels to be directed,” he says. When asked what is his biggest challenge as an Indonesian film director, Joko says: “To be able to stay on track [making] films that I want. It’s very easy to be hired [for] films that you are not passionate about." I am a journalist with the Sun newspaper.I am highlighting some of the best interviews I have done in my career. Hope you enjoy reading these articles as much as I have fun writing them.